Phoca Download is a Joomla extension that manages file downloads and uploads on a Joomla website. This tutorial shows how to change the maximum file upload size allowed in Phoca Download. Google's reCAPTCHA service will help protect your Joomla site from spam and abuse - especially from false Joomla user accounts being created by spambots. A Joomla site with reCAPTCHA installed on it has much greater protection against bots that make fake form submissions. This tutorial shows how to add this free service to your Joomla site. Developing a new Joomla template on a test site and then transferring it and making it the new template on your live Joomla site can be a real pain. 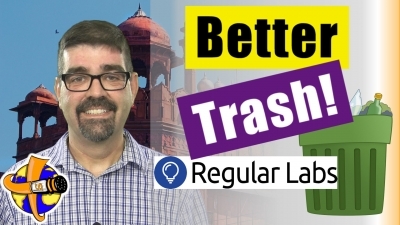 Regular Labs Better Trash - A better trash way for Joomla. Peter Van Westen's daughter thought there was a better way to do something in Joomla so he programmed it. It all relates to how you access trash in Joomla: to empty the trash for articles and also for menu items. So, Let's check out this new plugin from Regular Labs called, "Better Trash." First let's take a look at how the trash works without this plugin - how it normally works in Joomla. We look at content> articles - I'm already logged into the admin area of the Basic Joomla site - you will see I've got a couple of test articles here. If I select that article, which is published, and click on trash it's going to go to the trash. Now, if I want to see what's in the trash, if I click on trash here, it tells me I have to make a selection because basically in Joomla the only function of this trash button is to send things to the trash. And of course to see what's in the trash you have to go to the search tools and then drop down the Select status and then go to trash and then it will show you the items that are in the trash. That's a lot of steps. This new plugin from Regular Labs takes a lot of that out. In order to install the plugin you want to have Regular Labs extension manager and I have a tutorial on how to do that - where to get it - and I'll put a card up here, somewhere farther up of my little screen in the corner, and you can watch that to get that extension. If you already have the extension then you know just go to components>Regular Labs extension manager and this is where you can manage all of your Regular Labs extensions. So, we're going to go to Better Trash and we're going to click on install and we will click start of course. We'll wait for that to install. Once it's in it says "please clear your browser's cache" and then we will go back to content and articles. If we click check next to this test, we'll click trash again. Now watch what happens with this new plugin - nothing is selected - when we click trash it actually opens up the trash and shows all of the items. Now if there's something you want to get out the trash, you would then change its status by clicking on the trashcan. I could go back to published which will make it disappear from this view or you could, like we're going to look at now, just delete them. We could select all of them, but instead now notice the "trash button" has changed to an "empty trash" button and if we click on that we get a warning "Are you sure you want to delete. Confirming will permanently delete the selected items?" Because everything has been automatically selected here say, "Yes" and the trash is emptied. That's great. Let's look at it a little bit more. We'll go over to menus>all menu items. Now, this is showing, from my previous testing before getting ready to record this, all the items that have been trashed. Well, there are none so again we'll clear the search tools. Here's a whole bunch of menu items and I have down here, I've got a couple I created - deleted menu item two and three. Why don't we just click those two and then hit the trash button up here at the top and they're gone! Now without selecting anything we can go to trash and there's the two menu items which we can now get rid of if we don't want them anymore or restore or do whatever it is that you want it to do with them. But, let's empty the trash and before I do that let me just say that by emptying the article trash you're not emptying the menu trash. Those things are managed separately and that's a good thing because when you're confirming to delete everything and the articles for instance you might not want to delete other menu items in the other part of Joomla. But, we can click "empty trash," say OK and there you go, the trash is emptied. Questions for you Joomla fans: Are you going to use this new plug-in from Regular Labs- yes or no? Put it in the comments below and say why or why not. Or maybe you have an idea of some other little thing that would be really nice to be a change in Joomla to make things run a little more efficiently just like this plug-in does. At the end, in the end cards coming up very soon, there's going to be a playlist of other tutorials for Regular Lab extensions so check that out and be sure to subscribe and bring the bell for notification so that you can get updates whenever there's new videos coming out on the channel. So that's all for now, thanks for watching, enjoy your Joomla sites. God bless. Phoca Download is an excellent Joomla extension. It is used for managing file downloads you want your users to have access to. This tutorial shows how to upload files to it from within Joomla's back end administrator area. If you have files in a Joomla extension that does not give you the option to delete files you have uploaded, the Joomla file managment extension "eXtplorer" is a great solution to use. It's also a handy tool for other file management needs within Joomla. Just be super careful to not delete or move files that need to be where they lay! What is a Working Joomla Backup? In many of my tutorials I encourage Joomla fans to have a working backup before they perform maintenance and other processes on their Joomla site. David Burton of Lakeland Cottage Holidays has asked what I mean by "working backup."